I have never been a fan of discounting. As a vendor, offering a discount implies that your fee or your price is higher than it should be, and that you are comfortable making a sale at the lesser price, and are happy to do so. As a customer, asking for a discount insults your vendor, because the fee or price that they wish you to pay has been set, and you are asking them for a concession as a reward to you for being their customer. As a customer I never asked for a discount. Nor did I expect a discount when doing business with friends. All I ever ask is that the vendor provides me with the same exemplary service and quality product that they would for all of their full-fee-paying clients. I’d rather know that I was being given their best, than feel that I am squeezing them for less than best by asking for them to compromise me on their fee. If I’m a dentist, and I have a full paying patient need an emergency appointment with me urgently, then I’m going to scan my schedule and re-schedule a non-full-paying patient. Aren’t I? Similarly, if I have a non-full–paying patient needing to see me urgently, and my schedule is full up with full-paying patients, well guess who misses out? It’s a simple case of economics. I know dentists who give patients discounts if the patient has multiple procedures done at a single appointment. When I buy ten tickets to see Michael Bublè in concert, each ticket costs the same as if I had bought them one at a time. At the supermarket, the price of baked beans per can is the same whether I purchase ten cans or whether I only buy one. Some dentists seek low fee patients. These are patients who come through a PPO, or an insurance based plan, and the dentist agrees with the supplier to service these patients at a fee lower than his regular fee. When a dentist signs up for one of these plans, is it because there is just like a giant reservoir of these patients waiting to be released to this new dentist joining in the list? Or these plan patients seeing some other dentist nearby? Or further away? If they are seeing another dentist, then how loyal will these patients be to the new dentist? Or will they be more loyal to their plan? During my first year of owning my own dental business I learned a very important lesson about price-loyal patients…. You see, for the first four years of my life as a dentist I worked in other dentist’s offices and not for myself. During these four years I used to treat a friend of mine and his three children for rebate-only fees…my friend never paid any out of pocket for his dental work. And my friend was a loyal patient, travelling across metropolitan Sydney sometimes to see me every six months. But now that I was in business on my own, I informed my friend that from this day on there would be no more rebate-only dentistry, or “mates’ rates”. I never saw my friend ever again. I recently started working with a young female dentist who had only been a dentist for four years. She had bought a dental office that was not so busy, and so she had signed up for as many Medicaid plans as she could to increase her turnover. And increase her turnover she did. When I started working with her, her office had collected $1.07M for the year. But she was seeing sometimes sixty patients per day, and hygiene appointments were being triple booked on the hope that one of those might turn up….it was unorganized chaos. Over the space of eight months we SACKED over fifteen hundred patients from that office. My client wrote to these patients letting them know that if they needed dentistry under the Medicaid programme then they needed to go elsewhere, and she would happily send their records. 1500 patients in eight months? Despite firing fifteen hundred patients, my client increased her collections and collected $1.3M for the next financial year. Her office became a sanctuary for patients wanting to receive and willing to pay for the exemplary service that she was providing. She collected more seeing less patients. And she started seeing only those patients who wanted to see her, rather than all of those who wanted to use her as a convenience. 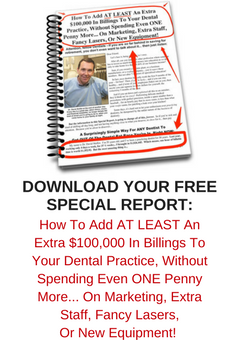 Twenty percent of your patients will provide you with eighty percent of your income. And eighty percent of your patients will provide you with twenty percent of your income. That eighty percent will also most likely provide you with one hundred percent of your headaches. You see, out there in the general population there exists twenty to twenty-five percent of people who are happy to pay for a good or service from any vendor so long as they perceive they are receiving exceptional care and service. When you cull out the eighty percenters, you create more room for the top twenty percenters who are seeking out what you have to offer. It is this portion of the population that you need to focus on attracting to your dental practice. I always look forward to my weekly Shephard Letter from my good friend Shep Hyken, and this week’s episode was exceptional. Shep reported that according to the Five9 Customer Index 2017 report, seventy seven percent of customers in the B2C space will not do business with your business again if you give them bad customer service the first time that they do business with you. What this means is that over three-quarters of your customers will not give you a second chance if you don’t give them the customer experience they expect on the first time they do business with you. For dentistry this is really important because the first time that someone does business with you could be on the telephone setting up an appointment time. And a lot of dentists forget this. A lot of dentists believe that the first time they do business with a customer is when you have them in the dental chair. Have you ever wondered why you have cancellations and no-shows from patients you have not met who have yet to have “officially” become your patient? This statistic could shed light on the probable answers…. Shep goes on to write that in any business, the customers are now smarter than ever before when it comes to the customer service side of things. This is because if they have experienced and are now getting used to and accustomed to world class customer service from OTHER types of businesses, then they will start applying THOSE levels of service as a standard they will now expect from you and all other businesses that they have to deal with. Rightly so, Shep points out that providing great customer service is now your competitive advantage. There will always be customers who value great service more than they care about price. For many, a great customer experience is a key reason that helps them decide which company to do business with. And, that reasons trumps price, product quality, and even recommendations from friends, according to Shep. Here are a few suggestions from Shep..
1. Customer service doesn’t just happen on the front line. It is a culture that needs to be present throughout the entire company. 2. Be present in the moment. Whatever you are doing right now, in THAT moment, with that patient, is going to ensure that the next time they need dental treatment, they will come back to you and only you. Make their day! 3. No company and no person is flawless. You can’t deliver a perfect customer experience all of the time. So, when there is a problem or complaint, don’t just fix it. Restore the customer’s faith in you. Go Above and Beyond!! The way that your business recovers from these occasional service defects will validate the patient’s original choice to do business with you in the first place and proves to them why they should come back. 4. Always show appreciation to your customer. Repeatedly thank and praise your patients over and over again. They want and expect to know you care. Hyken reminds us that although these ideas are common sense, sadly, they are not always as common as they should be, and are often forgotten and brushed over and are overlooked by businesses. Don’t allow your business to overlook the importance of having a great Customer Experience Culture in place. Your customers will value that experience. Because today more than ever they are now expecting that experience. Dentists Make Lousy Judges Of What Works When It Comes To Marketing. When it comes to marketing, the quickest way to go broke is to try and attract every possible customer out there. All marketing should be aimed at attracting a particular type of customer. Most people try to maximise their marketing and try to be almost everything to as many people as possible. When really, the contraire is true. The more specific you are with your marketing, the more of THOSE types of people you will attract to your business. Plus, that particular specificity will draw and attract a raft of customers who for them, this specific idea that you are espousing, had barely entered their mind. Your business does not need every possible customer or prospect out there. Your business does need SOME customers, but does not need EVERY possible customer. When your business grasps this concept, and when that penny drops, then and only then do you become in better control of your own destiny. It is this realisation that allows you as a business owner to not work seven days per week. It is this realisation that allows you to set your own fees that are not dependent upon the fees charged by your neighbours. It is this realisation that allows you to take leave from your business more often, and for longer. Dentists make lousy judges of what works and what doesn’t work when it comes to marketing. This is true for most businesses because most business owners think like business owners, and not like their customers and potential customers. When your business focusses on your customer firstly, before anyone else [and I mean before the owner and before the team], this will be the time that you will experience significant growth in your business. Don’t focus on your own personal internals before considering the thoughts and opinions and feelings of your customers and potential customers. You Miss One Hundred Percent Of The Shots You Don’t Take. Last month I flew interstate for a family arrangement. One of my relatives had started to see a new dentist right by where they lived, and when the dentist found out that this family member had me and Jayne as relatives, they asked if it would ever be possible for Jayne and I to pay them a visit. It was a lunchtime, and Jayne and I had an afternoon flight to catch home. So we thought we’d pop in, say hello, and then grab a bite to eat before our flight. So we did that. We popped in to the dental practice. And then disappeared behind a partition where I could hear, or overhear her explaining treatment and attempting to schedule an appointment with someone who [obviously] was also seated behind this partition. At the same time, a dental assistant emerged from the doorway of a treatment room, smiled straight at us, and then disappeared away down a hallway…. Well after about three or four or maybe more minutes of standing there waiting, Jayne and I decided to call it a day, and head off and get our lunch. We could call in there another time if we ever came back for another family visit. Does this happen in your dental office? What if we were two new patients walking in to that dental practice looking to schedule appointments? And then we were left unattended? And then we walked out? If the dental practice monitored its CCTV security, then they may have seen this event transpire. How was anyone in that dental office to ever know what we were there for? In your dental office, how are you to know who walks in and what they are after if you don’t have the personnel available to service every visitor? Are people walking in and then straight out of your dental practice due to a lack of available personnel to serve them? Are you letting the ringing phone in your dental office go unanswered, and sending it through to a service or to a machine? How do you know if the caller will leave a message? The cost of opportunities lost can be a killer to all businesses. Don’t let the dollars slip right out of your business while you’re trying to save an odd penny or two…. What Is The Purpose Of An Advertisement? How do I do good marketing? These are questions that are often overlooked by the customer [the business marketing] and therefore the advert or “piece” presented may not be as effective as it should be and could be. Your logo is unimportant to your potential customer. It may be something that impresses your mum, but it takes up space and means “not much”. I see a lot of poor marketing where the dental practice name is prominent in the advertisement. This is not necessary. It is taking up valuable space and often prime space. Your practice name does not have to dominate your advertisement. Photos need to be relevant. Otherwise they are copy stealers. A picture is not worth a thousand words when it is a useless picture. A picture of your dental chair, or of the outside of your dental office are only relevant to your mum. Your headline needs to arouse curiosity. Headlines that work best ask questions, and usually alert or remind the reader of a problem that they have. Instead of suggesting a solution. Your reader is more likely to take action to move away from a painful situation than they are to move toward pleasure. Fill all your space with as much copy as possible. Use your piece to drive the reader to your online information. Get your copy professionally written. You get what you pay for. My copy writer doesn’t drill teeth. Don’t confuse your reader about what you do. Stop trying to pile up everything that you do in one small advert. Pick your target market and focus on that for the entire advert. Why should the reader choose your dental practice? Your piece should clearly enunciate why the reader would be a fool to go anywhere else for their dental work, because your practice is the only one that does X and Y so well. A photo of the team. If space permits, a small PROFESSIONAL photo of a well-presented team [not in scrubs] is very useful. But not at the expense of good necessary copy. Your practice website should have professionally taken photos on it…not ones taken with an old Blackberry. The reader of your marketing piece needs to know what they need to do next….. Follow these thoughts when organising your next advert. Remember, if you copy what everyone of your competitors does, you’ll end up with the same poor results they do. Find out what everyone else is doing and do the opposite!